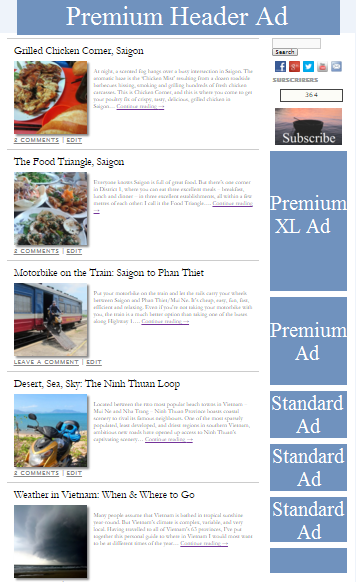 Personal, Targeted Ads: Ads on Vietnam Coracle are highly targeted. This is because I personally select ads that are relevant to the content I produce. My ads are an extension of the independent travel advice I provide: I only approve ads for services and products that my audience will be interested in or benefit from. Consequently, my readers are extremely likely to engage with your ad. Engagement & Productivity: My audience actively engages with my content: cumulatively, my posts and pages receive thousands of comments, and each day I receive emails from readers asking for more information about where to go, eat, drink, sleep, and how to organize it. Each week, I typically publish 1-2 in-depth guides, articles, reviews or stories, plus thorough updates to existing content, and daily social media posts. Advertising: I will consider advertising proposals from services and businesses that are relevant to my audience and the content I produce. 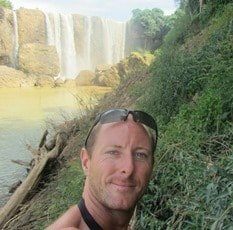 My main subjects are: travel, motorbiking, food, drink, accommodation, outdoor activities, and culture. 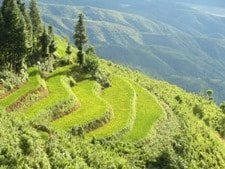 However, anything that I feel is of value to my readers, or will heighten their experience of Vietnam, will be considered (see Audience Demographics to better understand who my readers are). 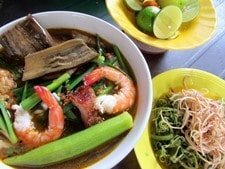 Examples of ads on my site include: travel agencies, street food tours, motorbike rental and tours, bars and restaurants, hotels, real estate agencies, and English language schools. *Please note: All ad banners are sitewide and receive two separate placements on every page of my website: in the right sidebar and at the bottom of every post (with the exception of the Premium Header ad banner, which is displayed at the top and the bottom of every post). See below for details. Standard, Premium, Premium XL banners are all displayed in blocks in the right sidebar and bottom of all my posts and pages. Ad blocks are arranged in a hierarchy according to banner size: Premium XL banners at the top, then Premium banners, then Standard banners. However, there is no hierarchy within each ad block: the order in which banners are shown rotates at random on each page. All ads are displayed under the title ‘Selected Resources for Travellers & Expats’. The Premium Header banner is displayed at the top (above the website title) and the bottom of every post and page (except the homepage). This is the most prominent ad space available on my website, and the banner is fully responsive. Above the header, the ad banner will scroll down as far as the title of each post or page, and then disappear; it will reappear when the reader scrolls back up. There is an option for readers to ‘hide’ the ad, but the banner will reappear again when the reader loads a new page. Subject to availability, the Premium Header banner is available for the exclusive use of one advertiser for $1,000 per month. Or, if the Premium Header ad space is shared between two different advertisers, the price is $500 per month for each advertiser. 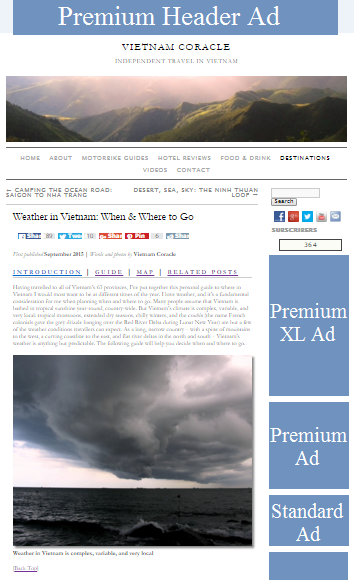 In this case, the header ad banner will rotate each of the two advertisers’ artwork every time a new page is loaded, so that both receive equal exposure. For example: when Page X is loaded, the header banner will display Advertiser A’s artwork; when Page Y is loaded, the header banner will display Advertiser B’s artwork, and so on. *Please note: All ad sizes and prices are fixed and non-negotiable: ad banner dimensions and costs are as above and there will be no exceptions. Designed for you: I work with a graphic designer who can create a striking ad banner for you at no extra charge. However, because of the work involved in designing the ad banner, this service is only available for 3 month contracts or longer. Designed by you: Alternatively, you can create your own ad banner as long as it fits the dimensions stated above. However, I ask that you are sensitive to the general feel of my website. 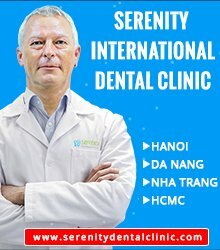 Vietnam Coracle is a highly visual place to be: the more your ad adheres to the aesthetics of my site, the more attention it will receive from my readers. If I am not happy with a proposed ad design, I will work with you to get it right. All ad designs must be approved by me before going live. Each ad is limited to one product or service, and one link URL. 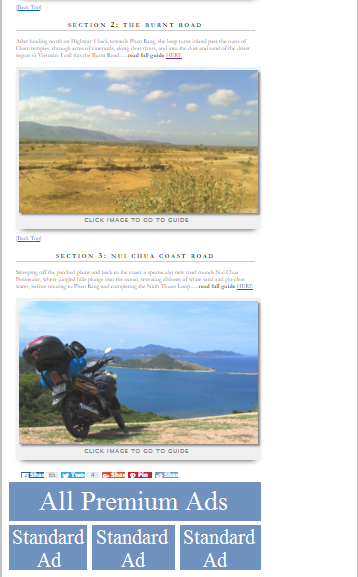 For example, if you are a motorbike rental company but you also offer motorbike tours, you will need to take out a separate ad for each service. Once I receive payment, I will make your ad live on my site and notify you immediately by email. Your ad’s time on my site will begin from the moment you receive this email. A few days before your ad expires, I will contact you regarding renewal. If no further payment is made by the time your ad expires, it will automatically be removed from my site. Once the advertising contract has been agreed and payment is made, there can be no refund under any circumstances. See contract for details. Alternatively, if you are not comfortable with this ’email contract’, let me know and I will send you a contract PDF file for both parties to sign. Further questions, email me at: [email protected]. Hi Tom, I am Tomas. Awesome blog that you have. 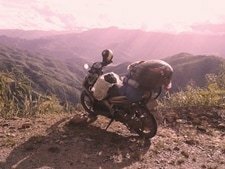 I wandered around Vietnam on a Motobike for several years, never occurred to write a blog for me. Congrats on utilizing your leisure to earn you money! I am the first to launch hot air balloon rides in Vietnam, in Mui Ne. Having in mind that this location does not have too many attractions, I wonder if this is something noteworthy for your blog. I am receiving multiple requests from bloggers for barter, claiming they have 11,000-50,000 followers. Your blog seams to be best of them. 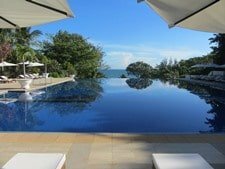 I was thinking: if we order ads on your web page (it’s more for visibility than anything else; I so understand your target audience is Vietnam – wide, and our attraction is just for people visiting Mui Ne), would you also be interested to write about us? Hot air balloon rides sounds very exciting. I don’t write sponsored reviews or guides of any kind, but I do offer advertising space to companies or services which I like, respect or think my readers will be interested in, as outlined in the Media Kit on this page.